I love riding on two wheels be it to work, Sunday brunch, or a mountain racing with my buddies. As an active person, I needed a bike that could keep up with the lifestyle I had in mind. 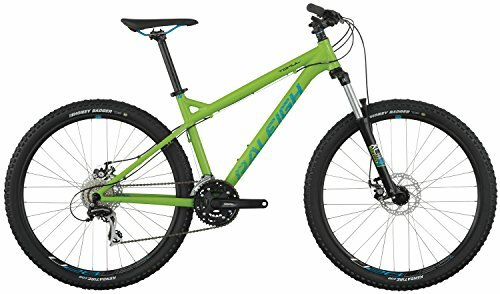 To be honest I was nearly giving up my search for the appropriate bike until a friend suggested I check out Raleigh Tokul 1 Mountain Bike. In fact, I was so impressed I couldn’t wait to share my experiences looking at and taking this mountain ride for a spin. Riding a bike is fun and this Raleigh Tokul 1 review can give you what you want. We will talk a little bit about what this outstanding bike can do for you including tons of details. So you are better off reading this whole article so that you can get a better result over time. The suspension fork of this bike is just awesome and it will allow you to smooth out a lot of bumps right away. We also have to talk about the disk brakes because they are just great. You will get through any weather condition when you harness the power of these brakes right away. The drivetrain is also important in this bike because it will allow you to take your ups, around and downs to the next level. The large wheels and wide tires were first to catch my eye. As large 27.5 inches and with tires 2.2 inches, it is easy to roll over rocks and roots. For an even smoother sailing on rough terrain, there is the SR Suntour XCM Suspension fork. These two features can absorb serious bumps on a rough trail. They provide improved control, traction, and comfort on potholes and rocky single track. Tokul 1 superior technical design and construction is built to offer a longer life with minimal maintenance and servicing. One of the most fundamental differences between beginner mountain bikes as well as other bicycles is the type of gear plus the gear ratio of each bike. Raleigh Tokul 1 has Shimano EZ shifters allowing you more than 21 gears to choose from. This means you don’t have to move your hands off the grips to get through things that cross your path. Shimano EZ offers faster shifts and the best part is the fact that a rider can shift several gears at once regardless of direction. The shifter has good ergonomics giving you the paramount fit for the palm when biking. Aluminum frame is most preferred by most bikers mainly for its strength and lightweight AL-6061 SL custom butted aluminum frame. Unlike the ordinary steel frames, aluminum frames such as the one used in Tokul 1 is not prone to rust making it a low-maintenance for cyclists. The strong aluminum frame keeps a rider in an upright position, protecting both the neck and backs from injury. Riding in an upright position is also an advantage in that it provides the perfect vantage to see obstacles ahead. Sometimes it is scary riding downhill on a hardtail bike and it can be pretty tedious going uphill. The Raleigh Tokul 1 features reliable Tektro Hydraulic Disc Brakes that make for perfect handling whether you are rolling down a hill or cranking up. Setting up is easy: line up the pads, clinch down, adjust for pad clearance, center, and you are done! The pads are threaded making them less finicky to get in place compared to the conventional smooth-post canti pads. Depending on your options or budget you can choose from small (5’3″ – 5’6″), medium (5’6″ – 5’9″), large (5’6″ – 6″), and X-large (6 – 6’4″). All these Tokul 1 mountain bike sizes have lest ride’ pedals that are excellent lightweight clipless pedals with a large platform for support. This is not only essential for road riding, racing, and other sportive participation, it is also classic and provides a vintage look is you want to look good on the track. The Tokul 1 also bears the reputable Kenda Honey Badger 27.5×2.2” tires which are best suited for both intermediate and hard pack terrain. The Honey Badger is a favorite especially for the massive amount of grip whether you take the straights or turns. Cornering knobs are situated far down the casing making it possible to test the limits of the turns. This is the sturdy, high-performance bike that you have been looking for a long time. You will manage any fast downhill section quite easily because the Tokul 1 has wider handles that have been specially designed for this. You will have no problems climbing mountains because this Raleigh bike has a shorter stern and an aggressive frame geometry. If you are a beginner in the world of hardtails, this bike is just what you want for you these days. If you want to take your cycling experience to the next level, this bike for you because it has all the features you need to takes your enjoyment to the next level. Riding in comfort bike and style has never been easier and this bike will allow you to get just that. If you are practicing technical trail riding, this bike is just what you want for riding. Taking the joy of riding to the next level is easy when you have this bike with you. Although you might have some issues with the suspension lockout, this bike will allow you take a couple of bumps a day. This bike has the outstanding geometry that you have been waiting for. You will also love the fair price of this bike too which is quite fair. You must also understand that finding a bike such as this one is truly hard. The lockout is just amazingly good if you have to deal with any sort of long climb out there. If you want to get a lot of gear range this bike has a nine-speed cassette that will allow you to get just that. So take action and grab this bull by the horns today as well. Once you’ve understood these features, it would be proper for you to consult an expert to help you find a Tokul bike that fits you. Everyone’s body is different; some have long legs and short torsos, and vice versa. Others have injuries, others shot arms and pedal differently, while some have one leg slightly longer than the other. All these factors, including others, affect how your bike should be set up to maximize comfort. Luckily, Raleigh Tokul 1 Mountain Bike is a package with a range of adjustable parts to ensure that you enjoy your ride. We have talked a lot about what this affordable bike can do for you, and this information will allow you to make a better decision over time. So you will manage to deal with any weather condition in this bike and this is quite amazing for you today because you will be having more fun. So I hope you enjoyed this Raleigh Tokul 1 review!